Today I added data on national origin to my booklog, which consists of every long-form work that I’ve read in the past five years. These notations are totally idiosyncratic. In some cases, they veered dramatically from what other people would’ve put. For instance, I did not mark Nabokov as ‘Russian’ because it just didn’t feel right. He seems like he’s as American an author as can be. In some cases, though, I did give people hyphenated identities: for instance, I marked Jhumpa Lahiri as Indian-American and Adrian Tomine as Asian-American. This listing also probably underestimates the numbers, since I didn’t look up the national origins of every writer. I think it’s very possible that I missed some Canadian, Australian, South African, and British writers in particular. Also, this dramatically underepresents the number of queer and Jewish writers, since I only marked people down as queer or Jewish if they didn’t fit into any other category (for instance, I marked Marcel Proust as ‘French’ and Oscar Wilde as ‘British’). This is obviously not the best way to measure this. Ideally, I ought to have a separate column for queerness and for religion. But the point of this exercise was merely to identify how many books I’d read that were not by straight, white Americans. So please, take this for what it’s worth. Note: Percentages are out of 918 total works. Interesting. Personally I would have marked Oscar WIlde as Irish, though I suppose British can be seen as technically correct given the dates of his life. See, you’re absolutely right. He is Irish. I didn’t know that. Another way in which my accounting was limited by my knowledge. This is a subject I never even would have considered, but it is very interesting. 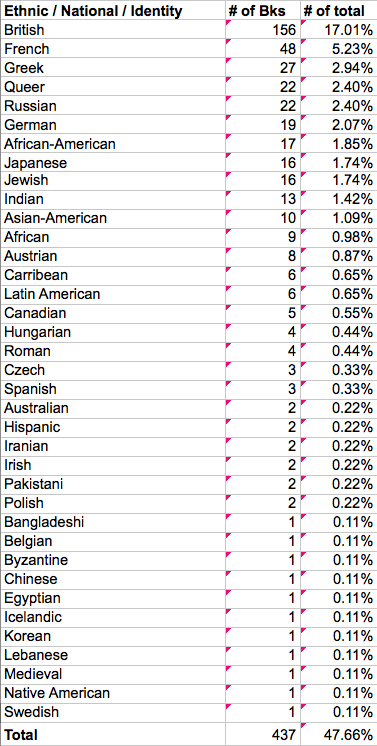 Now I’m curious about the nationalities of authors of the books I’ve read! 😛 Maybe some day I will figure all that up in the same way you have here! Oh, I also wanted to let you know I have tagged you in a Blog Hop post, details of which you can find over at my own blog (http://jrfrontera.wordpress.com/2014/03/28/the-writing-process-blog-hop/). It’s a pretty simple and short one, so I hope you’ll enlighten us with your own replies! 🙂 As always, thanks for the intriguing post! Ooh, sweet. Sure. I will take a look at it.